In our previous installments, Part 1 described BIP and why is it such an important metric for understanding the current state of your sales process. The reduction of BIP (for instance, as a ratio of overall sales) is the key to reducing sales waste along with the overall cost of customer acquisition, and increasing sales productivity along with company productivity. Part 2 discussed the core attributes of processes, with an eye toward sales processes, which ideally should be repeatable, scalable, and optimizable. If sales processes have these three attributes, then starting to get a handle on the size or value that your organization is investing in BIP becomes a realistic possibility. 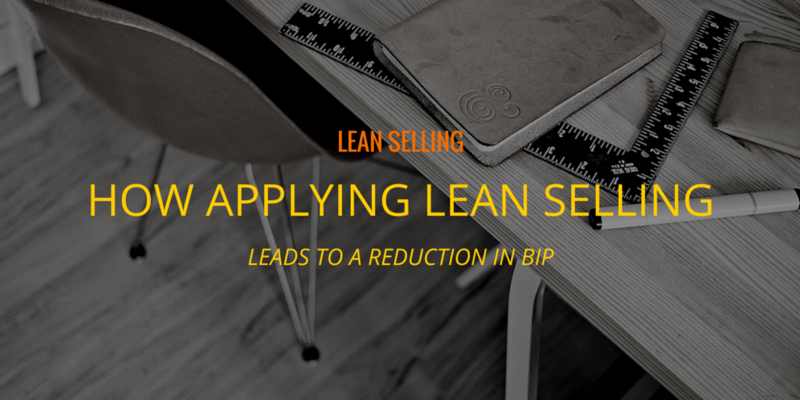 In this third and final installment about BIP and its important place in guiding sales process improvement, we will tie together all the concepts covered so far, by clarifying the role that Lean Selling can play in identifying and reducing BIP. We will begin by taking a more macro view that looks at the entire sales process as a system. Lean methodologies are focused on improving processes with the goal of improving an overall system or company objective that the processes should support. In the context of sales, we can say that the sales process exists within the context of a larger “selling system” that is supporting the higher-level company objectives. When it comes to sales, this objective is usually to grow the number, loyalty, and profitability of customers. Smart companies do this by focusing on what they can control: increasing the value and satisfaction they bring to their customers. Enlightened companies do the same thing for those who aren’t customers yet (i.e., buyers), as well. Lean Selling likewise looks at the entire selling system, which includes more than just the sales organization. This selling system often includes marketing and customer service but can also include functions such as product development, finance, and production (for either a product or service). Within the context of the goals of this entire selling system, Lean Selling provides a methodology to take a deep dive into the sales process to determine if it is supporting, or hindering, system objectives. One common example of a sales process not in sync with the overall system goal is when sales promotions are used at the end of a month or quarter to help achieve revenue goals. Sometimes sales bonuses or modified commissions are also used to reinforce certain sales behaviors. The mismatch of these promotions with the rest of the organization becomes apparent when this sales “push” is not in alignment with the ability of the company to deliver. It almost always results in an immediate reduction in sales margins, which adversely affects profitability by itself, not to mention the inefficiencies it causes in other parts of the company. Lean Selling begins by determining whether the current sales process is repeatable, scalable, and optimizable. If it is not, then it leads to the development of a correction and improvement plan, which is then implemented. Lean Selling provides tools to map the sales process and identify areas and activities in the process that are creating waste. Lean Selling provides a methodology to design an improved sales process that can reduce waste and speed up the sales cycle time. The prospects that the company invests in are of higher quality and more likely to make a buying decision. The cost of the waste that is removed from the process directly reduces BIP. Prospects move more quickly though the sales pipeline to a buying decision, and time is money. 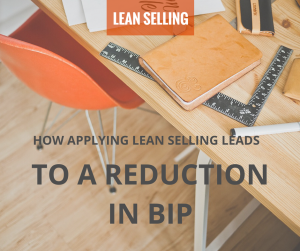 An additional benefits of taking a Lean Selling approach to understanding what BIP is telling you about your sales process is that it will help turn the sales process into a repeatable one where you can predictably and routinely meet (and then exceed) quotas and revenue goals. Most salespeople don’t have a steady, predictable flow of sales; Lean Selling can help change that. A primary goal of Lean Selling is to keep buyers moving along your sales pipeline. However, you can’t identify the best ways to do that unless you have taken the steps described in this series to analyze your sales process first. Once you identify and follow BIP from step to step in your process, you will begin to see where you can eliminate waste. The starting point for all of this is to have a defined process in place that supports the goals of your selling system. The data you gather on BIP will not be meaningful unless your entire sales team is following your process consistently.